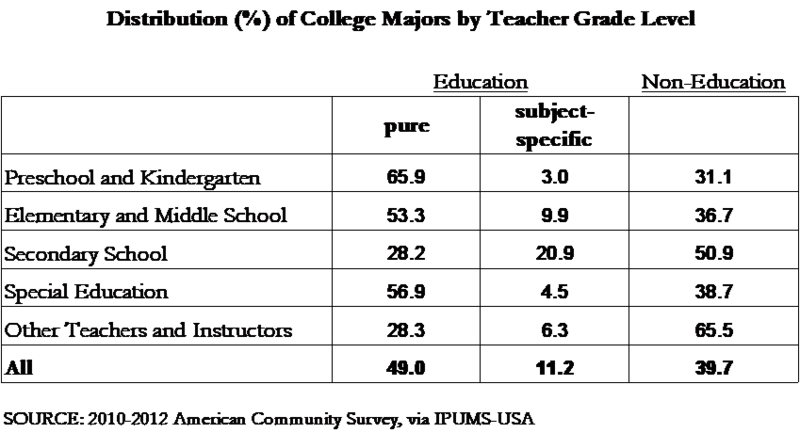 I received a request from Education Realist to detail how many and which types of teachers hold undergraduate education degrees, using the ACS data mentioned in the previous post. Right away we can see some limitations in the ACS data. It would be nice to separate elementary from middle school, and preschool from kindergarten, but we have to work with what's available. We also have to rely on the Census Bureau to accurately categorize respondents' descriptions of the work they do, and it's not clear that it has. 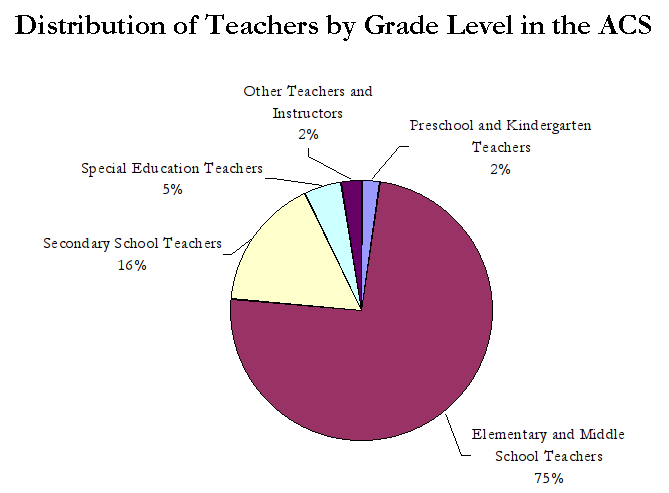 The percentage of secondary teachers appears too low--I expected to see around 25 percent--which suggests some misclassification. The table below shows how pure education, subject-specific, and non-education degrees are distributed among teachers of different grade levels. (Click the table to see a larger version.) Overall, 49 percent of public-school teachers in the ACS have a pure education degree, another 11 percent have a degree in how to teach a particular subject, and the remaining 40 percent have a non-education degree. This is outstanding. Thanks so much. I don't know if teacher turnover is high enough/the sample is big enough to allow this, but it might be interesting (and answer some other of educationrealist's comments) to use CPS to look at what people who were teachers last year but not this year are now doing. (CPS asks respondents what they were doing last year as well as what they are currently doing.) There's no major data there, unfortunately.